The MTX Monitor 60i power-packed bookshelf speaker is a great addition to any high performance system. Engineered from the ground up for accurate sound and exceptional imaging in real world situations, the Monitor 60i is in line with the high standards of performance expected from MTX. The Monitor 60i produces superior sound quality from a surprisingly small source. It features two 6-1/2" polypropylene woofers with rubber surrounds and a 19 mm PEI dome tweeter in a D'Appolito array, a unique design for a high output bookshelf. This arrangement reduces the unwanted reflective sound from floors and ceilings with a controlled vertical dispersion. 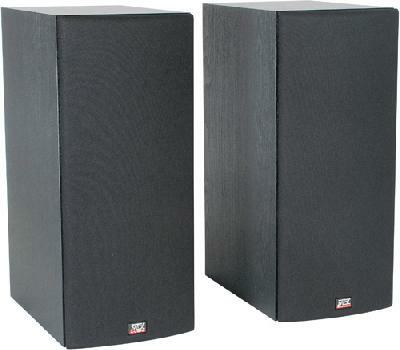 Plus, with the dual woofers in a common, vented enclosure, the Monitor 60i has a much lower bass extension, higher power handling, and higher efficiency than single woofer bookshelf speakers. Ideal for use in either Jukebox or Home Theater applications. Sold in pairs. Dimensions (HxWxD) - 17-5/8" x 7-1/2" x 11-7/8"